January | 2014 | YesBiscuit! An unlicensed transporter who was allegedly bringing sick pets from GA shelters to CT without health certificates was charged with 28 counts related to an “illegal pet adoption operation” by CT authorities. The state Department of Agriculture seized 10 cats and 2 dogs and took them to a vet clinic where 2 of the cats were euthanized due to illness. Shelter dogs have been trained to find illegal elephant tusks and rhino horns. The dogs work in airports, shipping centers and ports. Children’s book illustrators contributed to a new book by drawing their favorite animals. Animal advocates in Healdton, OK say they have been trying for months to get someone to feed, water and shelter the dogs at the city pound and/or to allow volunteers to help. The police department is in charge of the pound but the only thing the police would reportedly allow the volunteers to do is donate pet food, which would be left in a pile at the station. Meanwhile dogs have allegedly been starved, suffered frostbite and some puppies allegedly froze to death after being forced to sleep on bare concrete with the unheated pound’s 8 foot door left wide open by the police department all night. When animal advocates addressed the city council meeting Monday night regarding the allegations of ongoing abuse, the city manager was all “Whaaaa?” and claimed to know nothing. He did however feel immediate suspension of the police chief was warranted as well as an investigation. The investigation is ongoing but the police chief quit. The pound has been closed temporarily and impounded strays are being taken to a neighboring city facility. When animal advocates know public employees are not doing their jobs at the shelter, they often feel the appropriate course of action is to work with those in charge and aim to improve conditions over time. After all, we are frequently told that nobody wants to kill animals and some might believe that the abusers aren’t monsters, but rather animal lovers who have lost their way and need some guidance. This plan may yield results in certain situations. But most often, particularly where shelter animals are being starved, neglected and abused to death, animal advocates should take their complaints directly to the city or county funding the facility. This serves to create a public record of the allegations, places the responsibility on elected officials to take swift action, and eliminates any possibility of them claiming they were ignorant of the abuse. Waiting while animal abusers hurt shelter pets for months or years, hoping they will stop, is not advocating for animals. Bring complaints directly to the elected officials in charge of funding the shelter. If the shelter staff won’t do their jobs, make those seeking your vote for public office do their’s. Shelter pets can’t wait while compassionate people hope. 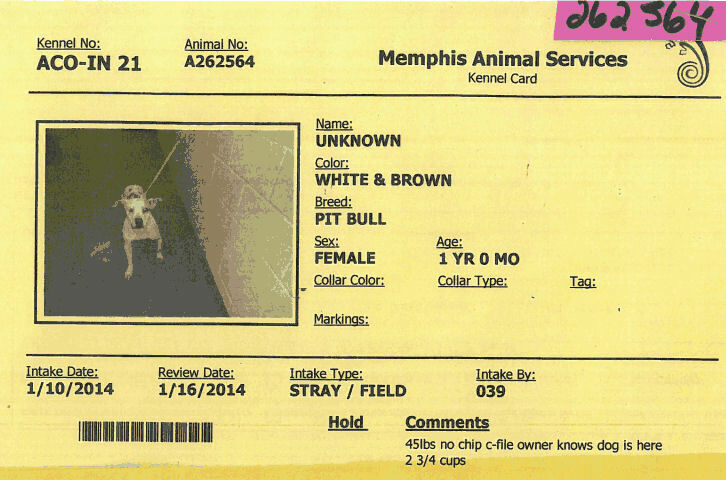 On January 10, Memphis Animal Services responded to a police department request for assistance with a loose dog. The ACO knew who the owner was and apparently spoke with him/her. The owner advised that the residence had no phone. MAS issued a citation to the owner and impounded the dog. 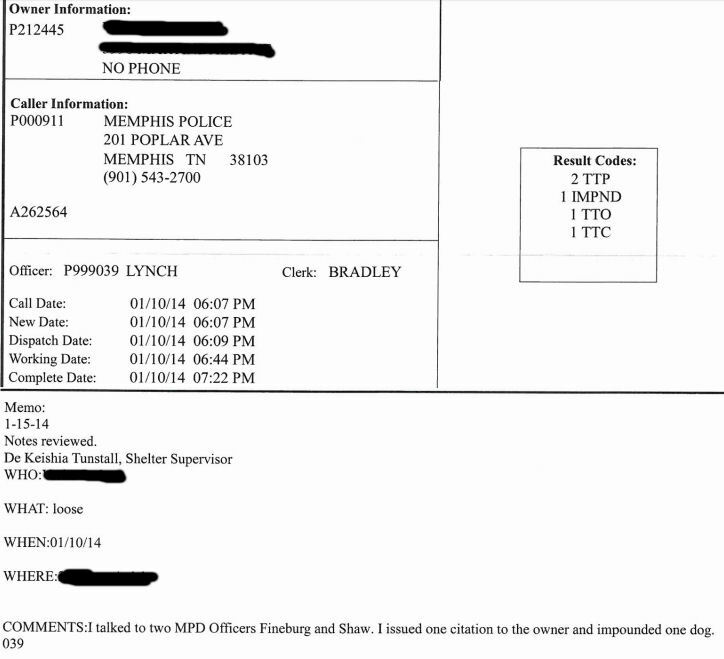 MAS records, obtained via FOIA request, partially redacted by me. MAS listed the dog as “stray” and entered a note on the cage card advising that the dog had an owner. 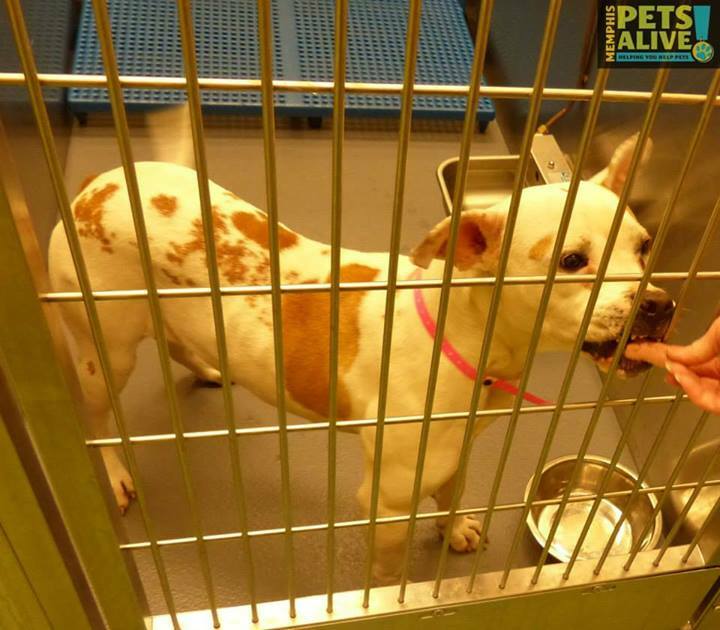 On this pet’s review date, the day MAS could officially offer her for adoption to the public, they killed her. Did the ACO think taking this dog away from her owner and putting her into the Memphis pet slaughterhouse was the best course of action? Did the owner, who apparently can not afford a phone, have any means of paying the fine issued by MAS in addition to the outrageous impound fees? Why did no one at MAS make any attempt to return this pet to her owner or even communicate with the owner to see if he/she had the ability to care for the dog? Why did MAS refuse to offer this young dog to the public for adoption, rescue or foster – even for one week, one day or one hour? Why did MAS take this apparently healthy, friendly pet to the kill room the minute her hold expired and she was eligible for disposal? Nobody WANTS to kill animals? Shyeah. By the end of 2012 the organization’s net assets surpassed $5 million. For the year 2012, gross revenues were more than $1.2 million, but expenses were only $436,757. 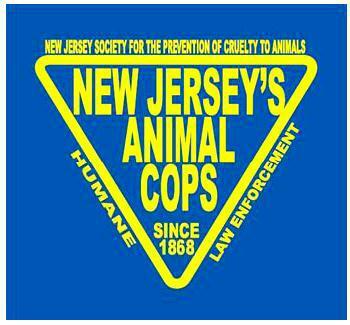 Two veterinarians working along with NJSPCA officers determined that 17 cats were in need of immediate emergency veterinary care. Those 17 cats were transported to an animal hospital in the Flemington area. Four of the cats were in such poor condition that they needed to be humanely euthanized. Hunterdon Humane Animal Shelter was previously the Hunterdon County SPCA, but the state SPCA revoked its charter in 2004. That action came after the local chapter failed to enforce animal cruelty laws by not prosecuting former Nets basketball star Jayson Williams, then an Alexandria resident , for allegedly shooting his Rottweiler after losing a bet. Conditions at the county SPCA shelter in Mt. Pleasant were discussed by former employees, who said the cats were overcrowded and sick animals were allowed to mix with healthy ones. A state SPCA investigator testified similarly about conditions at the shelter and said hygiene management was poor when he was there. At the hearing, witnesses testified that donations were made for specific items that were never purchased, and requests for expenditures on facility repairs, or additional food or equipment for the care of the animals were denied. Except for the NJ SPCA revoking Hunterdon’s charter in 2004, causing the organization to transfer its assets and change its name to Hunterdon Humane, no action was taken. Then NJ SPCA President Stuart Rhodes reportedly said at the time he would consider filing charges against the shelter but that never happened. Concerned citizens appealed directly to Hunterdon’s board in 2008, without result. Assuming NJ SPCA will apply its new found speediness in gaining access to Hunterdon’s fat bank account, I hope it’s their intention to repay every penny of donated resources and grants to the agencies from which they obtained them. Although those in charge at Hunterdon allegedly misused funds for years while animals suffered and the NJ SPCA did nothing, that’s not what should be happening now. This is one “unfortunate situation” where outside resources and grant money will be unneeded once NJ SPCA gets control of Hunterdon’s $5 million in cash and assets. There are a great many shelters and rescue groups in this country, particularly ones that have become overburdened trying to save animals from the kill room at their local pounds, which could benefit greatly from the resources and grants being directed toward Hunterdon. If NJ SPCA fails to repay every donated service and dollar received for helping the Hunterdon animals, it will be an immense disservice to every animal group in desperate need of those resources. And it will look more than a little suspicious that NJ SPCA dragged its feet regarding Hunterdon for 10 years, arriving on scene only after Hunterdon’s bank account had swelled past the $5 million mark and then held out its hand for donations. A stray Pitbull at the Greenville Co pound in SC was found with an old photograph of a man tucked inside his collar. No one has identified the dog, who may be killed for convenience at the discretion of the pound. KEPR in Washington reports that 3 seriously injured dogs were surrendered to the Tri-Cities Animal Shelter within the past week when their owners could not afford to pay for the necessary veterinary care. When I hear about these types of stories, I am sad for the families who are forced to give up their pets due to financial concerns. I also feel sad for the animals who, in a time of crisis, are likely confused and possibly depressed as they find themselves suddenly away from home in a strange, stressful environment. I always hope the shelter has some strategies in place to prevent these types of surrenders whenever possible. But in cases where that’s not possible, I am thankful the owners cared for the pet to the best of their abilities for as long as they could and when the animal’s needs exceeded their ability to pay, they sought help for the animal. Our shelter system is a safety net for pets who become homeless for whatever reason, regardless of whether their former owner died, became homeless himself or any other circumstance – known or unknown. This is what shelters are for – to help homeless pets in need, no matter how they became homeless. Right. But that’s not what the owners should have to do either. Because these animals have a right to live. Their owners loved them enough to give them up in order to protect that right. Serving as a refuge of last resort for animals in need is exactly what you’re there for and what your job is. Those owners could be facing criminal charges. Animal control works with the prosecutor to hold owners accountable for potential charges of animal cruelty, abandonment and theft. Unless the director has evidence the owners intentionally caused the injuries to these animals, I don’t see how any cruelty charges would be applicable. Abandonment implies they left the animal tied to a tree in the woods when in fact, the article makes clear the pets were surrendered to the shelter due to an inability to pay for vet care. Theft, I don’t even know. Surrendering injured animals to the shelter when the owner can’t afford to pay for vet care and has exhausted all options is what we want people to do. It’s why shelters exist. Without that safety net in place, we are driving people to acts of desperation such as abandoning the injured animal in a highly visible location in hopes that a Good Sam will take him in and provide the necessary care. It does not matter one iota how the pet became homeless, it matters only that he is. And once he is, it’s your job to help him Angela Zillar. Full stop. I wonder how many people in the areas served by the Tri-Cities Animal Shelter have seen this article and now believe if their pet ever becomes injured beyond their ability to pay for care, they need to either kill the animal or do something illegal in order to avoid prosecution by animal control. I hope local taxpayers contact their elected officials and demand that the shelter director stops threatening the public with prosecution and starts doing her job. Posted in animal shelter, tha hell? Pulaski Co dog breeder Dennis Bradley told a local reporter with a hidden camera that he had 58 dogs on his property, at least a dozen of them under 8 weeks of age, in November 2013. The reporter from WAVE in Kentucky filmed dozens of dogs crammed into filthy, rusted wire cages from which they were obviously never removed. 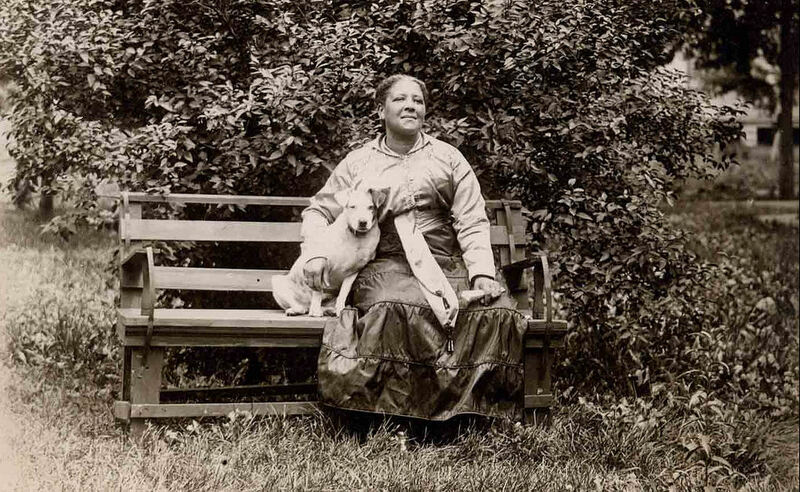 Among the breeds depicted in the video are Chihuahuas, Boston Terriers and Bloodhounds. The reporter asks him how much for a Schnauzer puppy and is told $300 for a female and $250 for a male. This certainly appears to be a dog breeding operation to my eyes, and a very poorly maintained one at that. Bradley, when contacted by the Commonwealth Journal in November, insisted his kennel wasn’t a puppy mill, but a non-profit rescue organization. A non-rescue would seem to be the more correct answer. Has anyone seen Dennis Bradley’s 501(c)3 documents for his so-called rescue organization? Perhaps they are on display in the bottom of a locked filing cabinet stuck in a disused lavatory with a sign on the door saying ‘Beware of the Leopard’. Video taken by the sheriffs department shows some of Bradley’s dogs sick and near death. Two were in such bad shape they had to be put to sleep. So why is Bradley still in business? Animal rescue groups say shutting down a puppy mill can cost up to $70,000 in shelter, food and medical expenses for the dogs they remove. Sometimes, groups like the Animal Rescue Corps will pay the cost, as it did when it broke up an alleged puppy mill in Wayne County in September. Former Pulaski County Animal Shelter Director Darren Wesley would eventually remove 21 dogs from the property — some of which were euthanized after they tested positive for parvo. After allowing dogs to languish in these conditions for another full year, authorities finally received assistance from the ASPCA and worked out a plea deal with the owner. Bradley pleaded guilty to one count of second degree animal cruelty. He received 24 months’ probation and surrendered all but 5 dogs, including one elderly dog. He will not be allowed to have more than 4 dogs or to re-start his breeding business during the probation period. Does this strike anyone as a good deal that protects dogs or does it look more like the appearance of justice, suitable for framing around a full color donation plea? The ASPCA took 43 dogs to the KY Humane Society in Louisville on Tuesday. When a county sheriff raids a facility containing sick and dying dogs alongside newborn puppies, has video to document the inhumane conditions, provides sufficient evidence to get cruelty charges filed against the owner, but lacks the resources to help the dogs, this should be the kind of thing the multi-million dollar animal welfare groups get on yesterday – not one year later. Does it matter to anyone at the ASPCA that dozens of dogs were left living in horrible conditions in the care of someone charged with animal cruelty for an entire year for lack of resources? And then when they finally decide to show up, it’s all ASPCA logo jackets for the cameras and donation pleas and press releases – as if the ASPCA just busted this place this week. 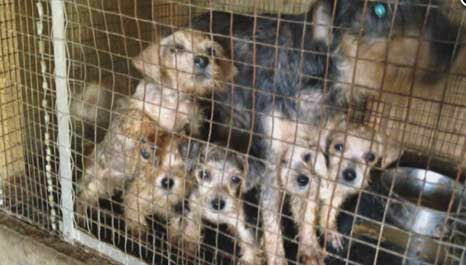 In truth, the cruelty charge stems from the work done by the local sheriff one year ago and the dogs needed help then. I imagine we might end up seeing these Pulaski Co dogs in a TV commercial with a Sarah McLachlan song. If and when that happens, remember they were knowingly left to suffer in tiny cages in the care of someone charged with animal cruelty for an entire year while the ASPCA closed its checkbook to Pulaski Co and counted its money. The killing apologists in charge of Medina Co, OH were finally publicly shamed into giving up the gas chamber at the pound. Now the county is planning to sell the torture device to the highest bidder. If I had the money, I would buy this gas chamber myself and send it to the car squashing machine at the junkyard. It’s the only way to be sure this barbaric equipment will never again be used to inflict pain and suffering on animals. The county says someone could possibly buy it for scrap metal. Yeah that’s possible but sorry, I’m not willing to take any chances. The stakes are too high. Unfortunately I don’t have the money. But if you are part of an animal welfare group with millions in the bank and you want to prevent any animals from ever being killed in the Medina Co gas chamber again, buy this gas chamber and destroy it. Because Medina Co won’t do the right thing. I’m hoping we can find someone to do it for them. An anonymous donor has offered $10,000 to Medina County if officials agree to turn the county animal shelter’s gas chamber over to the Medina County SPCA to be destroyed instead of being offered on an Internet auction. F-star-dollar sign-percent YEAH. Anonymous Donor, you can be my friend. Pets were killed in their kennels in full view of other animals. Animals were chokepoled and then jabbed in random areas of their body with syringes containing improper dosages of Fatal Plus. Some animals took “quite awhile” to die, thrashing in their cages, spewing blood and feces. Victims of the botched “euthanasia” procedures were placed into the freezer alive. The TN Board of Veterinary Medical Examiners conducted its own investigation into the claims and apparently found them to be truthful. Last month, the board placed the Campbell Co pound’s euthanasia license into a probationary category for at least one year. The board had a long list of violations, among them professional incompetence, not using a euthanasia room separate from other animals, acts of dishonesty, and inappropriate use of lethal solutions. “It sounds worse than it is,” says Campbell County Mayor William Baird. “We hope we got all the problems fixed,” Baird says. We hope. We can’t say we know all the problems are fixed because that would imply some sort of supernatural ability to know a thing that’s our job to know. But we hope. Because even in our darkest hour – which this is not, because it sounds worse than it is – erm, even in our medium-lightest hour, hope springs eternal. I’m remembering when the Campbell Co deputy mayor blamed Those Meddling Kids for the problems at the pound and retaliated by refusing to do his job. I’d really like to put the Campbell Co mayor into some sort of Ultimate Jerk Cage Match against the deputy mayor to see who wins. It’s necessary. Because otherwise we have an unsolvable mystery on our hands.